A mental commitment robot PARO was made to heal and comfort people at hospitals, nursing homes and day care centers. 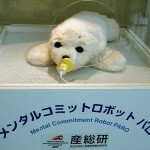 The study of this mental commitment robot has started since 1993, and a large number of data shows that it has the same effect as animal therapy. Paro is active during the daytime, but gets sleepy at night. Paro has five kinds of sensors: tactile, light, audition, temperature, and posture sensors, with which it can perceive people and its environment. Paro can also recognize the direction of voice and words such as its name, greetings, and praise with its audio sensor. Paro can learn to behave in a way that the user prefers, and to respond to its new name. Paro is an autonomous robot, so it can express its feelings, such as surprise and happiness, voluntarily by blinking its eyes and moving its head and legs. Paro has an electromagnetic shield, so it can be used by people with a pacemaker. So far PARO was introduced to America, England, Sweden, Italy, Korea, Brunei and Denmark. On November 16th, it will be released in American market and also Danish medical institutions will have 1000 PARO by 2011. Secret Menu of Famous Franchise Shops in Japan!